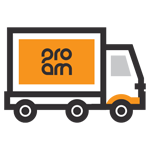 *Only applies to orders placed on pro-amkits.co.uk, orders placed from Online Shops do not qualify for any free shipping promotions. **These delivery times only apply to in stock items and that do not require customisation. The specified amount of shipping days only applies once the order has dispatched, this is not an estimation of order processing times. Please refer to the customer service page for more information about shipping times on customised items. International shipping rates can be calculated in the shopping cart.